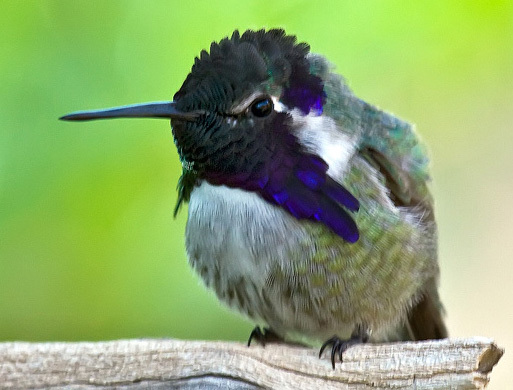 Costa's Hummingbird: Breeds from central California, southern Nevada, and southwestern Utah southward. Spends winters in southern California and Mexico. Prefer arid habitats supporting Joshua trees and cholla cacti. The Costa's Hummingbird has a large range, estimated globally at 560,000 square kilometers. It is native to the nations of North America and prefers savanna, shrubland, grassland, and desert ecosystems, though it has been known to reside in rural and urban areas. The global population of this bird is 3,600,000 individuals and it does not appear to meet population decline criteria that would necessitate inclusion on the IUCN Red List. The current evaluation status of Costa's Hummingbird is Least Concern. The Costa's Hummingbird was named after French nobleman Louis Marie Pantaleon Costa, Marquis de Beauregard. A group of hummingbirds has many collective nouns, including a “bouquet", "glittering", "hover", "shimmer", and "tune” of hummingbirds.